I thought it was about time I sort through my pictures from the summer and posted a few up for you to see. 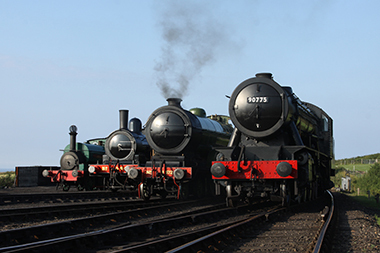 The first batch are from the line-up of the M&GN Society's four steam locos. Hello – it's been a busy first half of the year! 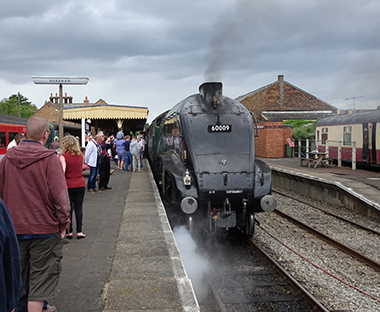 Gresley A4 Pacific 60009 Union of South Africa was the star attraction at the MNR's Summer Steam Gala. I took a couple of pictures to record the A4's visit, click here to view. 32G was the shed code of the former railway village of Melton Constable (Norfolk's answer to Crewe). Melton was a major railway junction on the former M&GN (Midland and Great Northern Joint Railway), with lines to Kings Lynn (South Lynn, and the Midlands), Cromer (Beach), Norwich (City) and Yarmouth (Beach). It was also home to the M&GN's locomotive, carriage and wagon workshops, where repairs to the company's locos and rolling stock would have been carried out. The M&GN was the first major casualty of the railway closures which took place in the late 1950s and 1960s. On 28th February 1959 the majority of the 161 mile M&GN network was closed. Melton remained open until 1964 when the Cromer branch was cut back to Sheringham. If you drive through Melton today you would be forgiven for thinking if there was actually a railway there at all, let alone a once busy railway junction. However some the buildings still remain, including: the engine shed, water tower, goods shed. These are now utilised as part of Melton Constable Industrial Estate. This site is predominantly a photographic website, and all the photos you will see have been taken by myself. I choose the name 32G because I have a particular fondness for the M&GN, and Melton Constable would have been the closest engine shed to my home had it still been there today. Copyright information: All photos are © Benjamin Boggis. Please feel free to view as many images as you wish, however they may not be reproduced under any circumstance without written permission from myself.